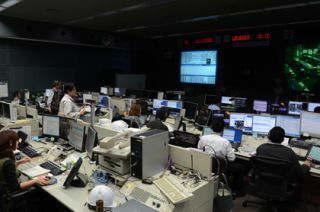 JAXA Flight Control Team (JFCT) resuming the Kibo operations at the Mission Control Room (MCR) at the Tsukuba Space Center in Japan 11 days after it was damaged in the 9.0-magnitude earthquake of March 11, 2011. Japan has reopened its primary mission control center for part of the International Space Station, 11 days after it was damaged by the massive earthquake that struck the country. JAXA, Japan's space agency, reactivated its Tsukuba Space Center on Tsukuba Island, Japan, on Tuesday Local Time (March 22) following an inspection to ensure the facility is safe for workers. The center is the home of JAXA's mission operations for the Japanese Kibo laboratory on the space station, as well as for the unmanned H-2 Transfer Vehicle (HTV) cargo ships that ferry supplies to the orbiting lab. This photo shows some of the damage to the Tsukuba Space Center in Tsukuba, Japan, the main space center for the country's JAXA agency, from the 8.9-magnitude earthquake that struck on March 11, 2001. This photo was provided to collectSPACE.com, a SPACE.com partner. "After a gigantic earthquake in Tohoku and Kanto region, these operations at TKSC were temporarily shut down and handed over to NASA's Mission Control Center in Houston (H-MCC) due to damage and security issues caused by the earthquake," JAXA officials said in a statement. "This week, safety of the ground facilities was confirmed, the ground systems were activated, and the network communications are online again." During the space center closure, some Japanese flight controllers worked out NASA's space station Mission Control Center to oversee the Kibo module and HTV-2 cargo ship docked at the orbiting lab, NASA officials have said. Astronauts on the space station have been filling the HTV-2 spacecraft with trash and other unneeded items to be disposed of when the cargo ship intentionally destroys itself by burning up in Earth's atmosphere. Japan calls its HTV spacecraft Kounotori (Japanese for "White Stork"). The first vehicle in JAXA's robotic cargo ship fleet launched in 2009. The HTV-2 vehicle launched on Jan. 22 and arrived at the International Space Station five days later. The spacecraft are designed to fly themselves near the space station and be captured by a robotic arm on the orbiting lab controlled by the outpost's crew. The three astronauts living on the space station plan to undock the HTV-2 craft from the station on March 28. The spacecraft is expected to burn up in Earth's atmosphere on March 29.